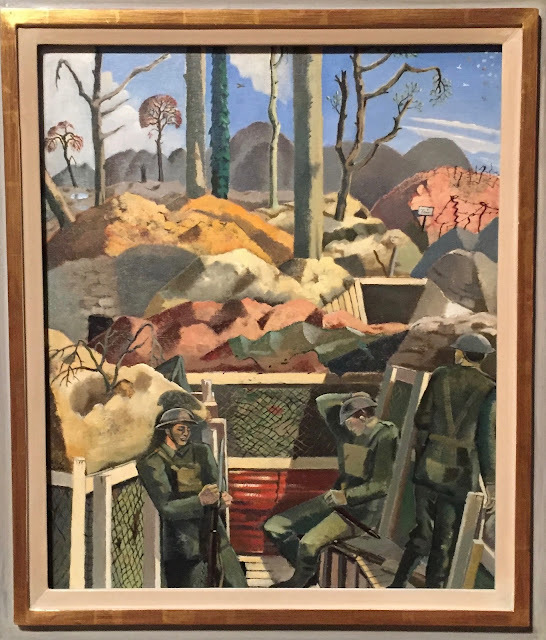 To the Tate for Paul Nash. A biggish exhibition, perhaps a little too big, but fascinating. I've had a soft spot for Nash ever since an exhibition of his photos at my school in the early 1970s. I feel possessive. Among the very first pictures is one which features a moon and pyramids. It is a geometric theme than runs through almost all his work, giving it its distinctiveness and tension: the war between curve and straight. That early picture also has a mysteriousness which is present in almost all his subsequent work, and provides the seasoning that brings the paintings their liveliness. Nash's trees and hills and suns and moons are given a mythic identity; I was reminded of Samuel Palmer. Nash is a romamtic: the world is not as it seems; nature contains meanings. By later landscapes I was reminded of Ivon Hitchens, who surely learned from Nash, who by this time seems more interested in the paint on the canvas, so to speak. There is more than a hint of abstraction. A very worthwhile exhibition. Nash was not a great painter, I think, but he was a very good one. Top of the second division. This is a great oversimplification, but I think, in the end, the paintings say more about Nash himself than they do about the world. Having said that, I was at Seatown recently, below Golden Cap, and the moon had risen as the sun was setting over the channel, behind me. There was a clump of trees on the rise of a hill, and it was mysterious, and it made me think of Nash, and Nash made me feel this little landscape's power, so maybe I'm wrong, and he has helped me see the world.